Regional artists are often the best at capturing the spirit of place. Many such artists are never known outside their area, but one such American art movement is gaining national attention. The Florida Highwaymen were a group of African-American painters who beginning in the 1950’s produced landscapes of the coastline and swamps of their native Florida. In a time when the American South was highly segregated, they sold their works out of a car trunks thus earning the group it’s nickname. These local artists and their dreamy, iconic landscapes are being re-discovered and appreciated by a new generation of collectors for their historical, social and aesthetic value. The Florida Highwaymen began as two men – Harold Newton and Alfred Hair. Talented self-taught artists, they received mentoring from Beanie Backus, a landscape painter, and quickly broke out on their own. Painting for their own enjoyment and to make money, the pair had some success and taught other interested would-be artists their technique. The group eventually grew to 26 members. Since no gallery would take the work of these African Americans, they sold their paintings out of their cars along the highway. The charming images and very reasonable prices made these paintings popular among Florida residents and tourists alike. Some estimate that the Highwaymen collectively produced 200,000 paintings over a 30+ year period! Harold Newton – “Winter Sunset”. Harold’s brothers Sam and Lemuel later joined the Highwaymen. 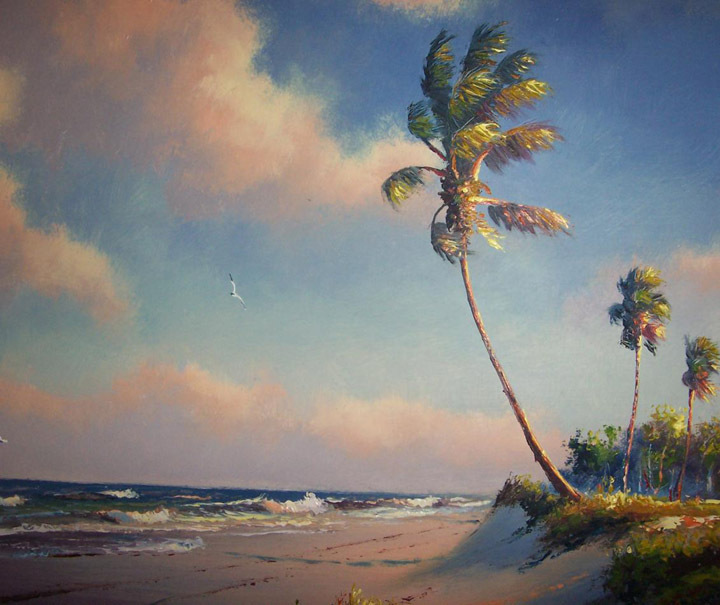 The Highwaymen’s paintings are so popular because they show off beautiful Florida. Many paintings feature swaying palm trees and sandy beaches. Other depict the calm tranquility of the inland waterways and swamps. You could easily find morning, daytime and sunset scenes. Their palette was bright and colorful while still naturalistic. Knowing what consumers wanted, the Highwaymen even used proverbial “templates”, or reoccurring themes, to create variations on a single scene. I can’t help but admire the variety but consistency in Highwaymen art considering that is was created as a group endeavor. Sam Newton – “Wetland Scene”. The painting were originally sold with these artificially distressed frames to give them an antique look. The Florida Highwaymen are beginning to get the credit they deserve both for creating the an iconic landscape and for being brave and entrepreneurial artists. Today’s collectors are as interested in the story of these self-taught artists as they are in the relaxing landscape images. 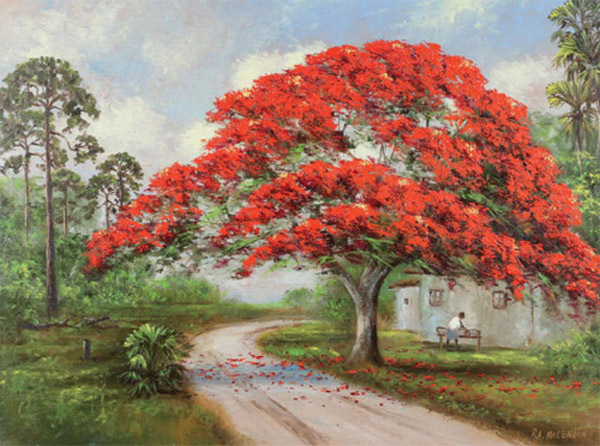 In addition to private galleries, the work of the Florida Highwaymen can be viewed at the Museum of Florida History in Tallahassee, the Orange County Regional History Centre in Orlando, and at the Florida House in Washington DC. I’ve never heard of this group before, but it’s really fascinating. Thanks for bringing it to my attention!